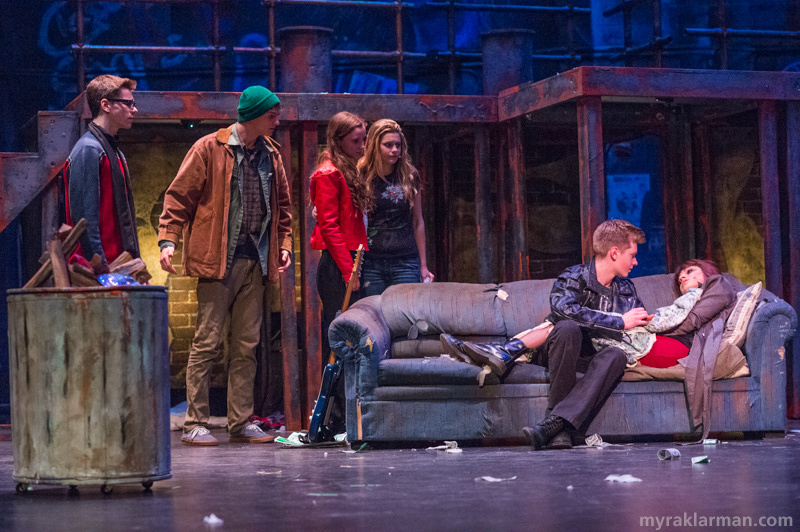 First, forgive me for the delay in launching this blog entry about Rent! There has been so much going on at once (most of it just good ol’ life). I appreciate your patience. 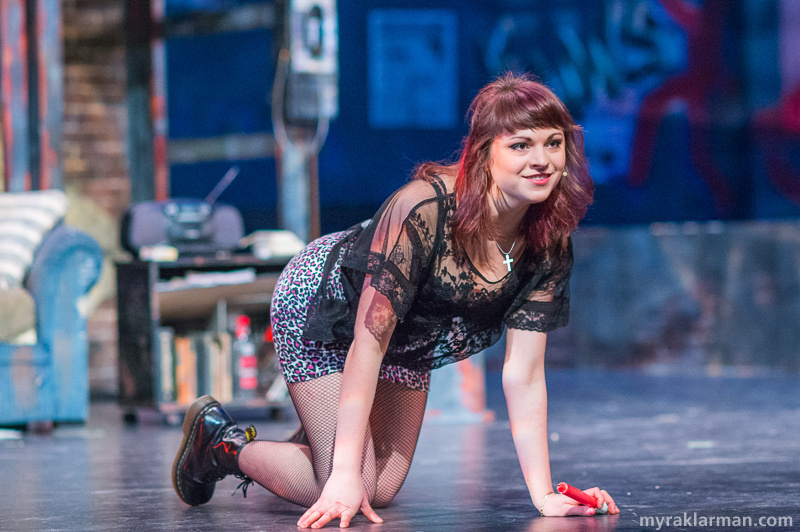 When I first heard that Pioneer Theatre Guild was doing Rent, I was filled with dread. I knew very little about the story, just that several of the characters had HIV/AIDS. It wasn’t so long ago — or at least it doesn’t feel like so long ago to me — when I was in high school myself, just outside Manhattan, and the news was filled with horrifying stories of this then-mysterious disease that killed everyone who got it. So many young people died. I wasn’t sure I wanted to revisit this chapter. I went to Wikipedia to get a sense of the show’s background and plot, and was led to an article in the New York Times written by Anthony Tommasini. 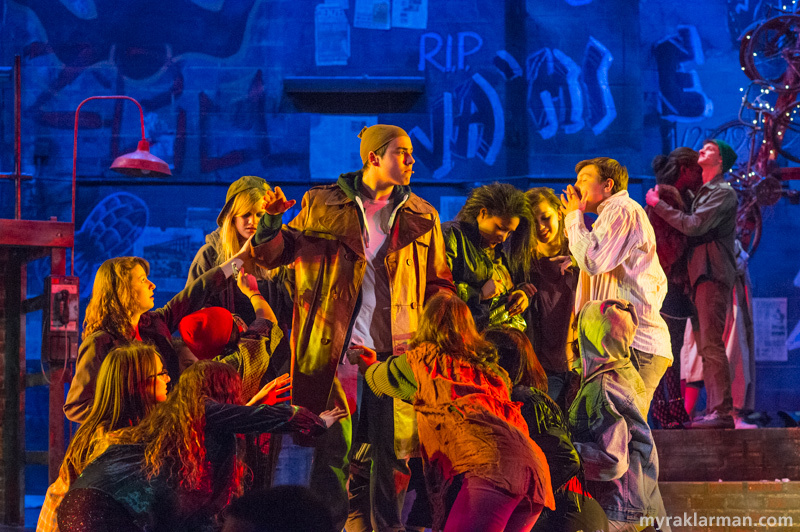 Tommasini interviewed Rent creator Jonathan Larson right after the final dress rehearsal, just hours before Larson died (of a congenital heart condition). If you want to learn more about what was involved in putting together the original show, including thoughts from Larson’s mentor Stephen Sondheim, I recommend the article. 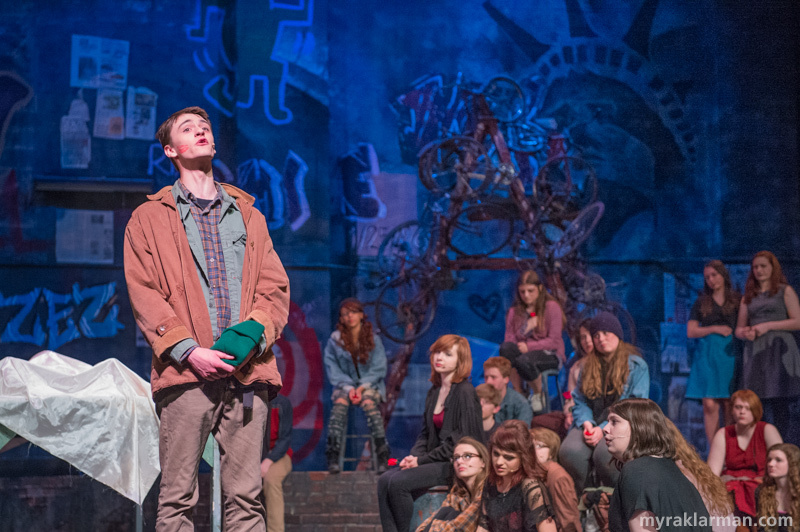 The only reason I would ever even see Rent is because PTG was doing it. In addition to photographing the last dress rehearsal (which really isn’t remotely like watching the show, truth be told), I took Max to one of the performances. What a relief to be able to tell him that nowadays, thanks to medical advances, people with HIV can live long, full lives. 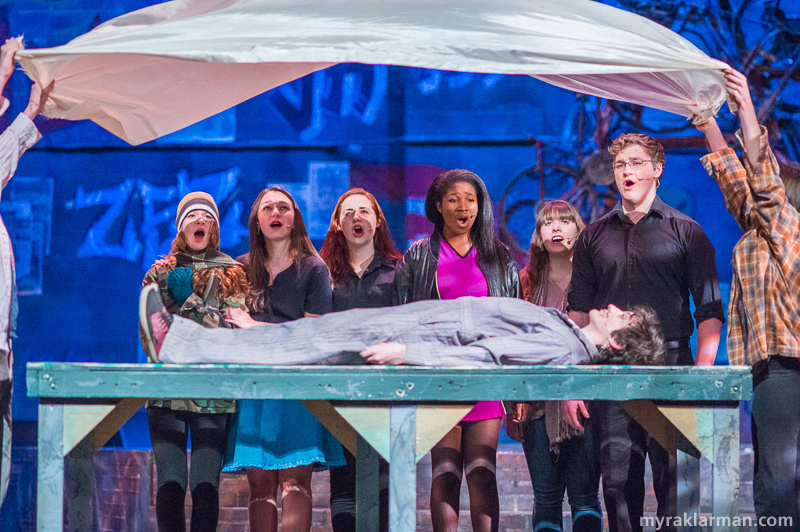 Even so, when characters on stage died, we felt it. And when they celebrated their time together, we felt that, too. 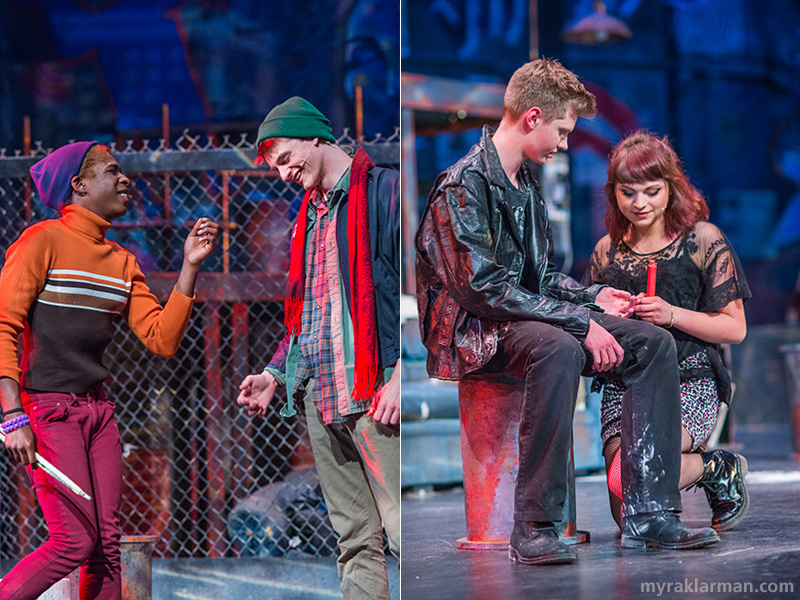 A big thank you to Emily Uhlmann for carefully crafting the captions accompanying my images below. Fortunately, she’ll still be at Pioneer next year, and my fingers are crossed that we’ll all benefit again from her captioning brilliance! 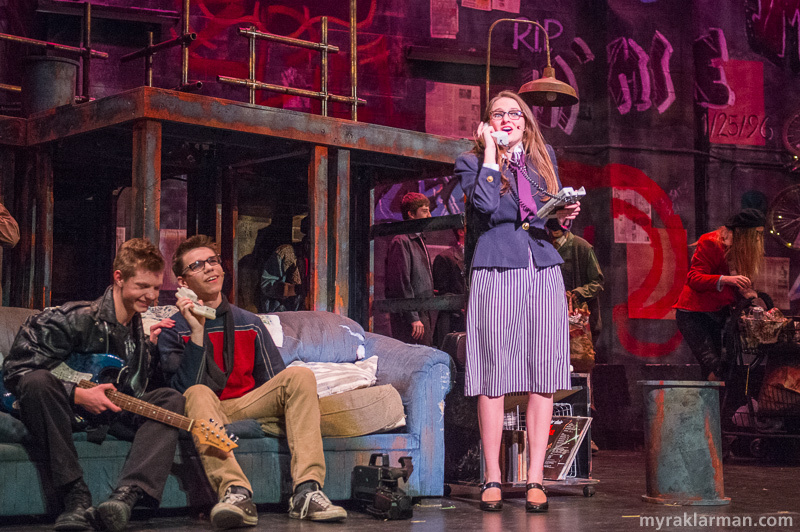 Roger Davis and Mark Cohen (Nathan Stout and Remington Reackhof) laugh as they listen to a voicemail from Mark’s ridiculously forthright mother, Mrs. Cohen (Emily Uhlmann). Roger Davis (Nathan Stout) reminisces about his life before becoming HIV positive, and remembers his girlfriend from that time, April (Ivy Gleason). All the while longing for that “One Song Glory,” which he can’t seem to find. 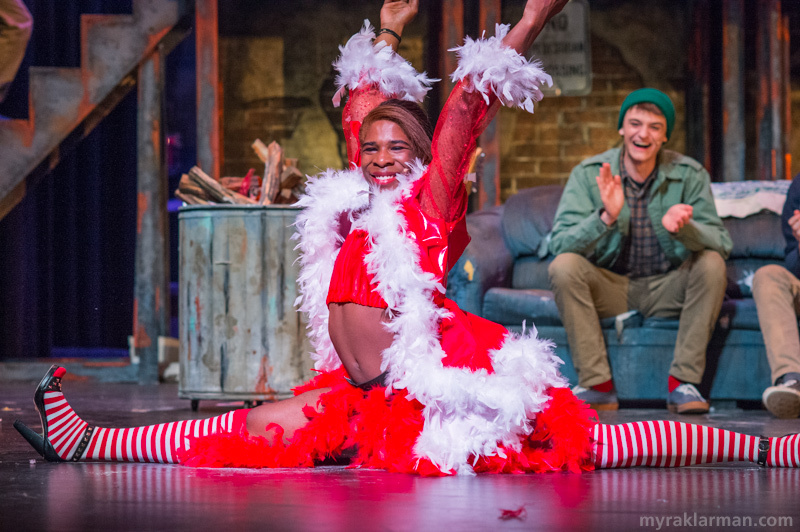 Cross-dressing diva Angel Dumott Schunard (Robbie Stephens) lights up the stage with her fabulously fierce dance AND vocal number “Today 4 U” — in heels! 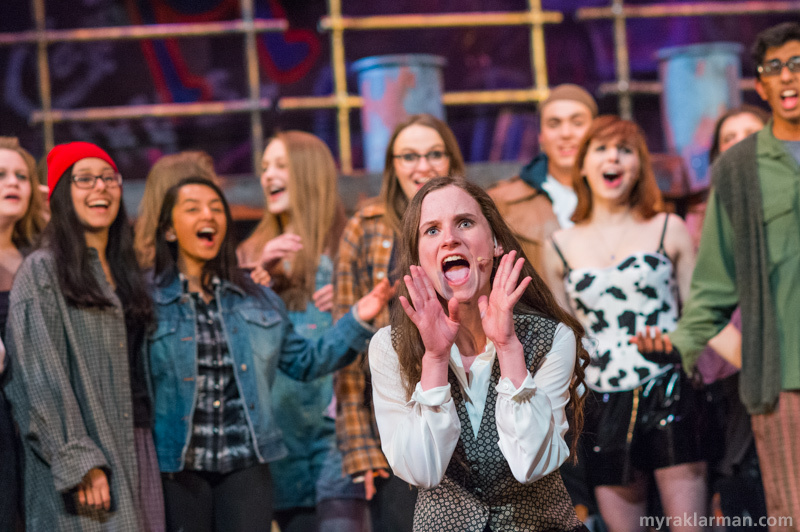 And what would a killer musical number be without the perfect finishing touch? Angel (Robbie Stephens) effortlessly hits the final pose of the number — splits! — as Tom Collins (Caleb Horvath) watches fondly. An ex-roommate (and ex-friend) of Mark and Roger’s, Benjamin “Benny” Coffin III (Michael Shapiro) stops by the apartment. Benny is now the owner of this apartment. He hopes that Mark and Roger will convince another ex-roommate of the pair, Maureen, to cancel the protest she is holding that night. In return, Benny says he will forgo Mark and Roger’s rent. Under not-so-ideal circumstances, Mark Cohen (Remington Reackhof) meets his ex-girlfriend’s new girlfriend, Joanne Jefferson (Adriana Ellis). The pair sings the duet “Tango: Maureen,” bonding over the diva they both fell in love with. 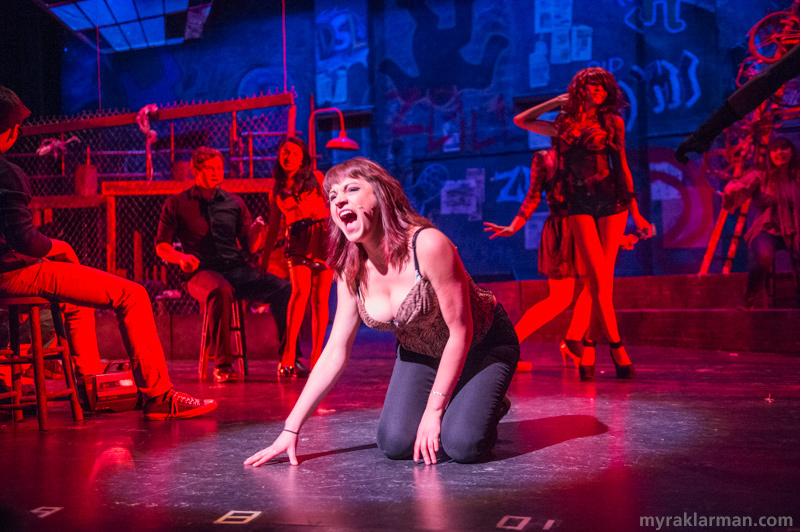 Starting at the club where she is working and ending in Roger’s apartment, Mimi (Olivia Roumel) gorgeously belts out her plea to Roger: Take me “Out Tonight”! 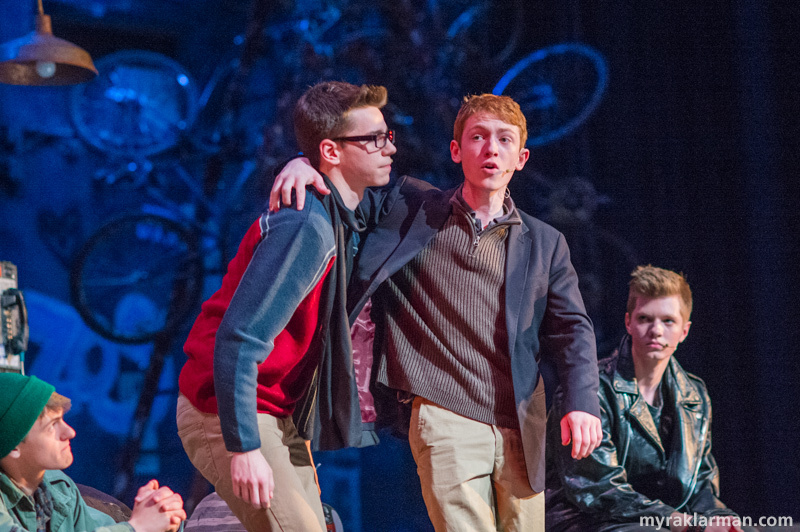 In “I’ll Cover You,” Angel and Collins (Robbie Stephens and Caleb Horvath) promise their devotion to each other in a rather adorable manner. Needless to say, this number elicited from the audience more than a few “aw”s (not to mention tears). The bitter New York cold shows no mercy in December. The homeless and the junkies try to keep warm by clustering together, often around makeshift trashcan fires. 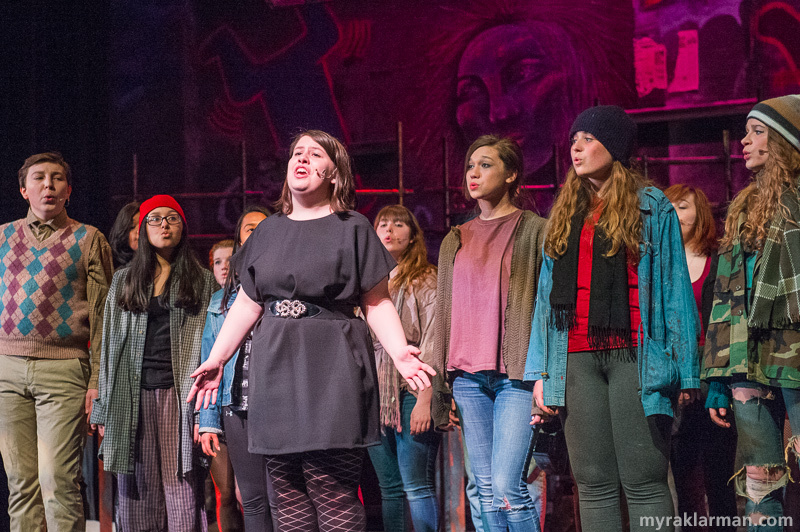 One of the “Seasons of Love” soloists, Abigail Hirshbein, helps open the second act of the show, while the whole cast backs her up in a beautiful rendition of this famous number. 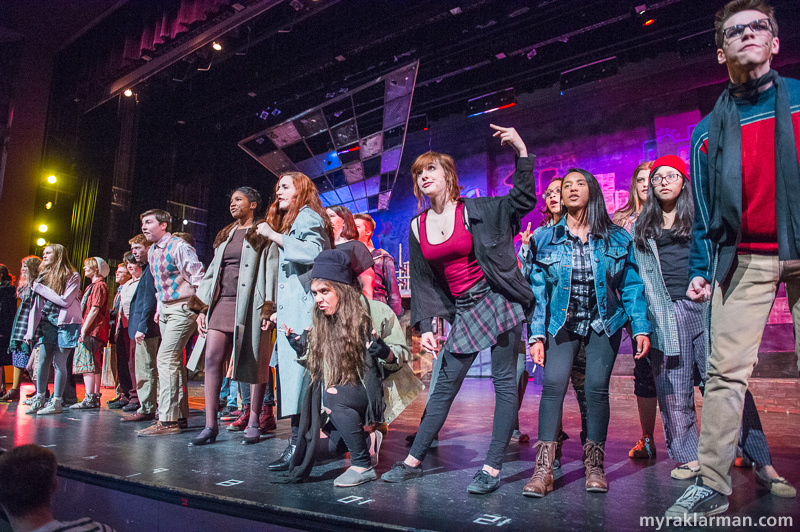 It was certainly a cast, crew, and crowd pleaser! 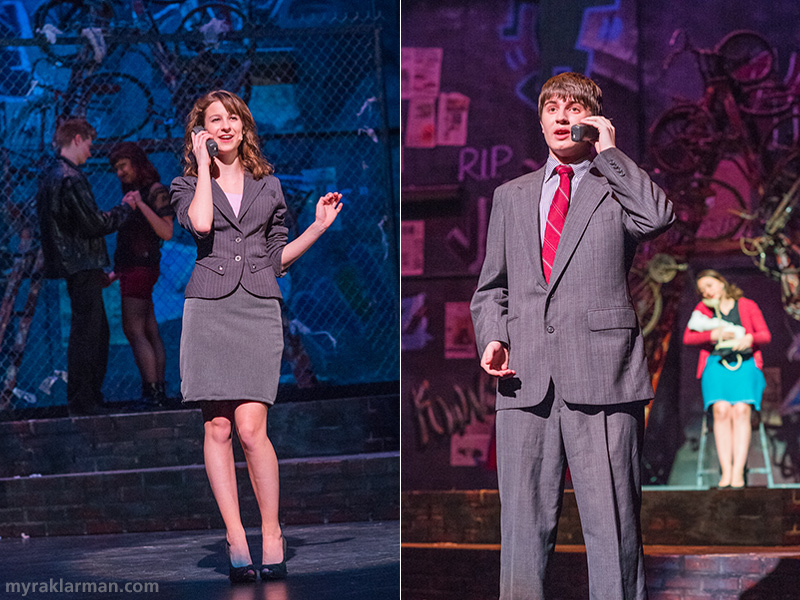 The second act is filled with unanswered voicemails. One left by Alexi Darling (Sabra Satz-Kojis) lets Mark know that his footage of Maureen’s riot has spiked interest within her company, Buzzline, and she is sending him a contract. | Later in the show, a concerned Mr. Jefferson (Arthur Mengozzi) leaves a message for his daughter, Joanne, asking where she is. Trouble in paradise: After a relatively smooth patch in their relationship, Maureen and Joanne (Rose Meehan and Adriana Ellis) hit the rocks again. In “Take Me Or Leave Me,” the incredibly talented duo belt — and out-belt! — each other. 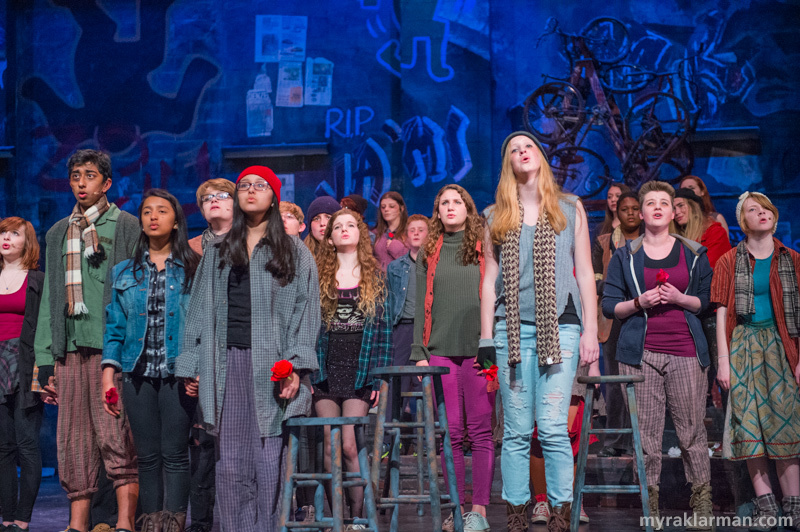 In “Seasons of Love B,” the cast members sat on stools they carried on while holding single white flowers in their hands. 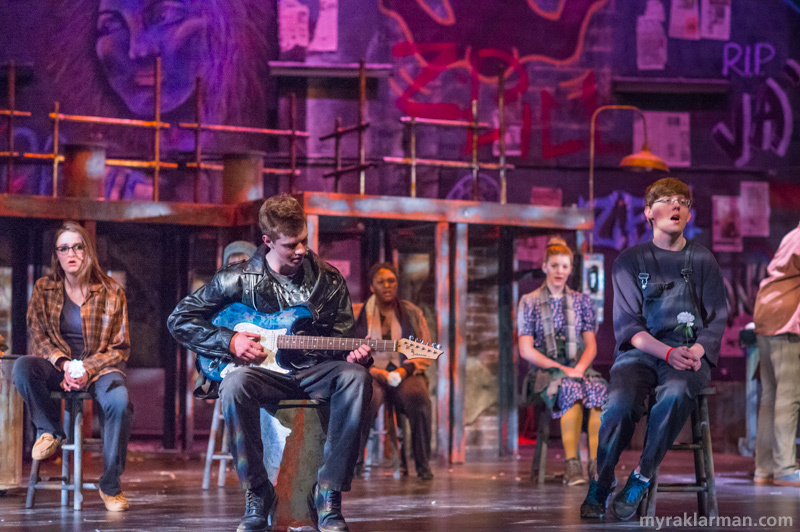 The simplicity of this staging kept the lyrics’ message crystal clear: the way to measure a person’s life is in how much they loved and were loved. 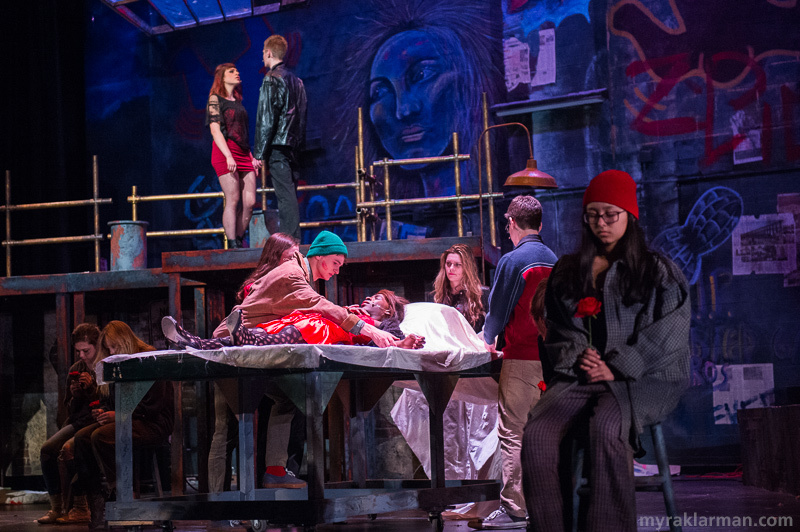 The white flowers held by cast members in “Seasons of Love B” are now red in “Without You,” as Angel (Robbie Stephens) is surrounded by his friends in his last hours of life. 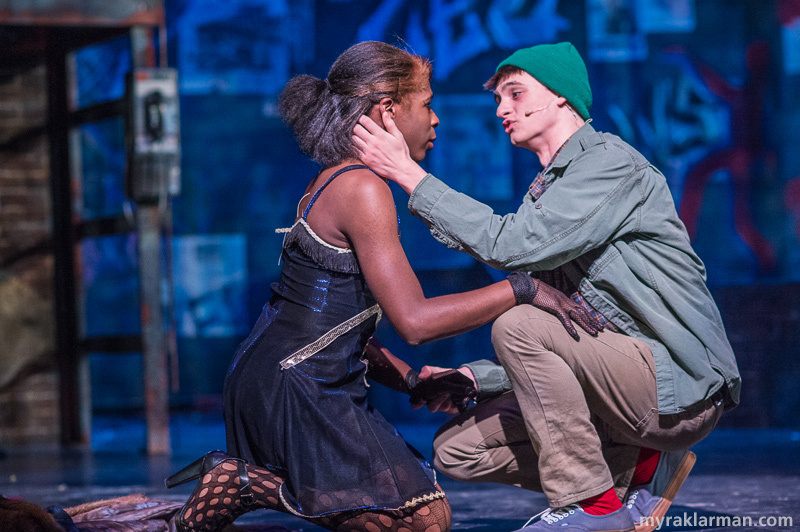 Tom Collins (Caleb Horvath) shares his love and heartbreak over Angel’s death in “I’ll Cover You (Reprise).” There wasn’t a dry eye in the audience or on the stage — or backstage, for that matter. 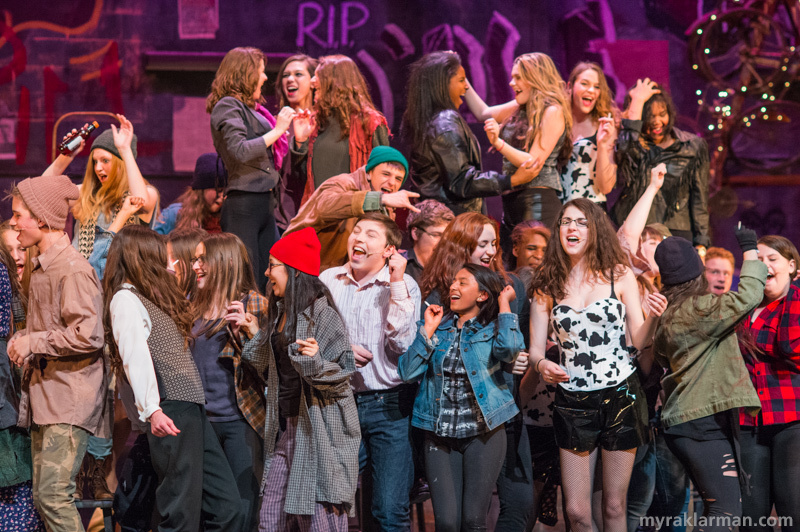 By the end of the number, the entire cast had joined in to celebrate the life, and mourn the loss, of Angel Dumott Schunard. 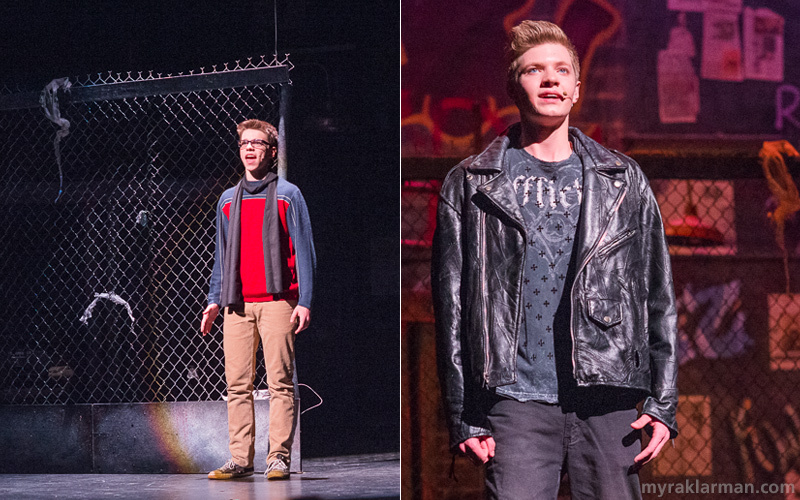 Mark Cohen and Roger Davis (Remington Reackhof and Nathan Stout), now on opposite sides of the country, perfectly sing the powerhouse rocking number “What You Own.” By the end of the number, the pair are back in their New York apartment and hugging. 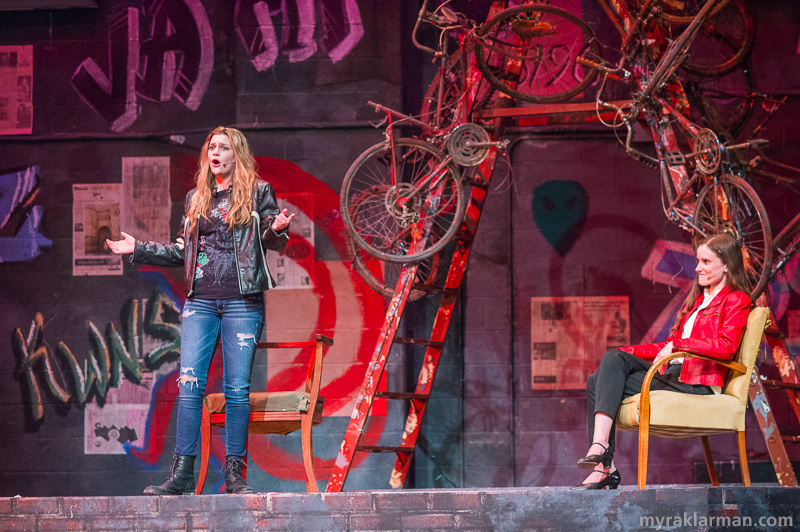 It’s been a whole year since the first scene of the show and conditions have not improved for the homeless and the junkies living on the grungy streets of Alphabet City. 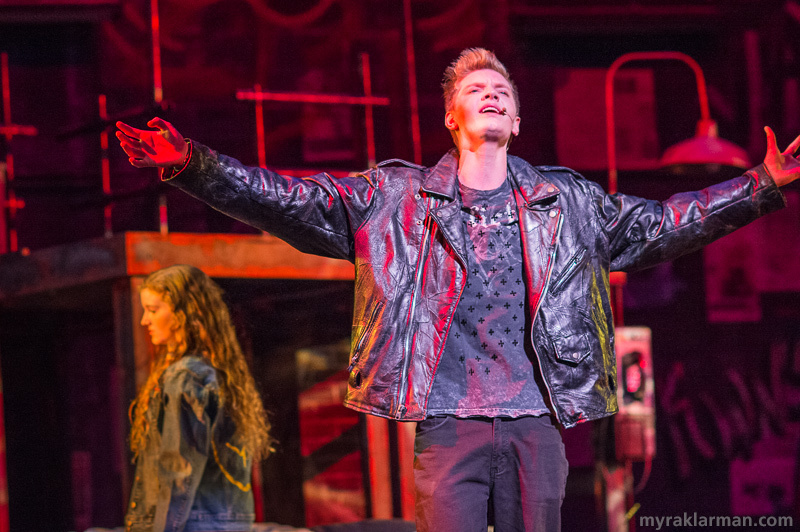 Roger (Nathan Stout) finally found his song, but he can’t find Mimi to sing it to. That is, until Maureen and Joanne find her “huddled in the park, in the dark,” and bring her to Roger’s apartment. 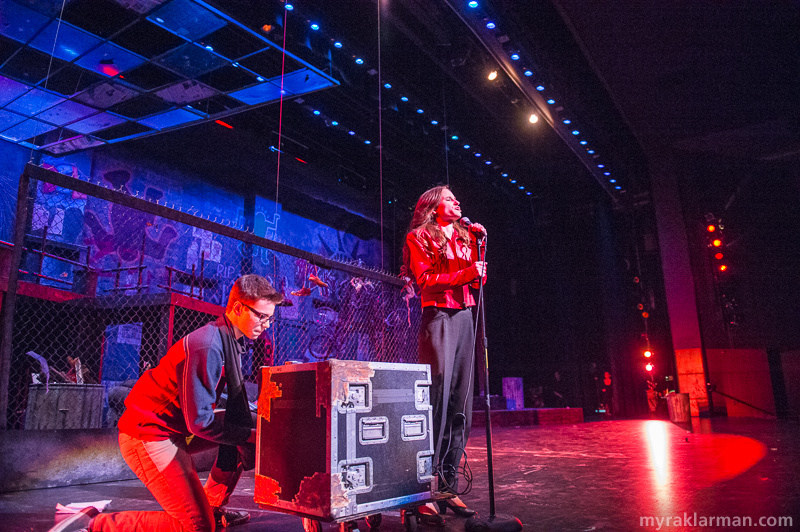 Clinging to life, Mimi (Olivia Roumel) listens to the song “Your Eyes,” which Roger wrote for her. Their friends Mark, Collins, Joanne, and Maureen (Remington Reackhof, Caleb Horvath, Adriana Ellis, and Rose Meehan) look on. These pictures bring back such sad memories of that time period when HIV was a certain death sentence. 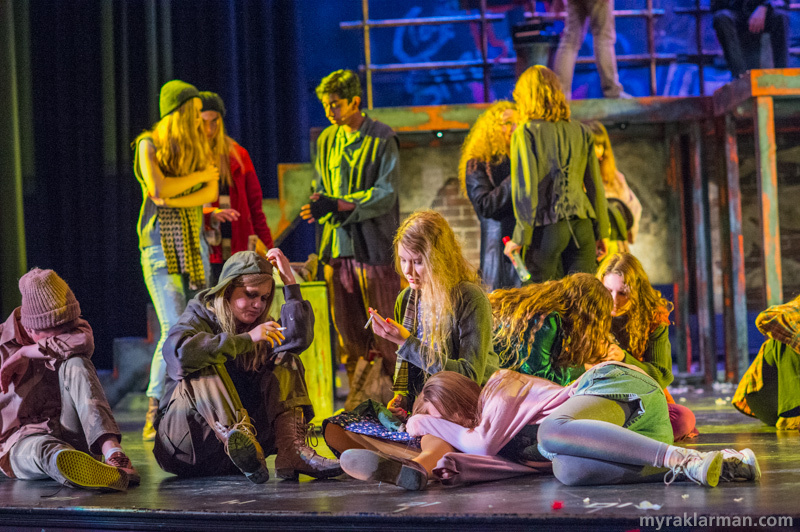 It was and is almost too sad to contemplate, but despite that, it is clear from the pictures that Pioneer Theatre Guild did a great job with this difficult project. 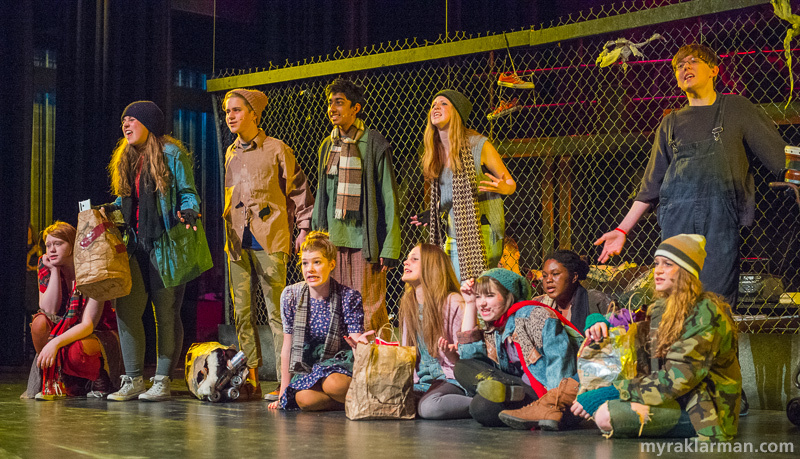 Unfortunately we were not able to see the show, but kudos to all of you who presented it and to Myra and Emily Uhlmann for helping us share in the sad, but beautiful, experience.